I'm going to be totally honest: up until a few days ago I knew very little about how a man's health contributed to a healthy conception. Both my pregnancies were planned, and, as a fairly healthy person myself, I actually didn't have any huge concerns of my own before trying to become pregnant with both my babies. As a result, I did very little to prepare myself for pregnancy. I know my husband didn't do anything specific either. I'm going to be blunt: Sperm health and quality begins to decline around the age of 25. Supporting a male's reproductive/sperm health prior to trying to conceive can contribute to a healthy conception. 1. Make healthy food choices. There's no question that plenty of vegetables, fruits and whole grains contribute to any healthy body, regardless of the stage of life we're in. In addition to that, seek out whole foods that are rich in nutrients like zinc, selenium, vitamin C, vitamin E and folic acid to optimize sperm health. 2. Exercise: Research shows that male fertility is boosted when a body is less inflamed, weight is managed and stress is low. 20-30 minutes of daily cardio activity helps with all those factors. 3. Give up vices: Smoking, alcohol, drug use, excessive caffeine, fatty foods and trans fat intake can all affect sperm health. 4. Keep cool: since sperm are produced in an environment with a temp slightly lower than the rest of the body, exposing that area to excess heat can slow things done. Warm or hot showers are perfectly fine, but avoid saunas and hot tubs. 5. Consider taking a dietary supplement to support sperm health: Little is known about supplements to recommend them to all men who are preparing to conceive, but, on an individual basis, a man may want to speak to his physician about the benefits in taking a prenatal male fertility supplement. 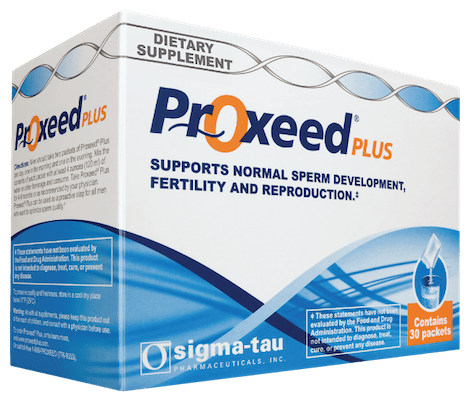 Proxeed Plus is a patented prenatal male fertility supplement specifically designed for sperm health. It's a simple way to support male reproductive health and sperm quality by providing nutrients needed for developing sperm. It blends essential male fertility vitamins and nutrients like zinc, ceramides, Vitamin B12 and selenium with documented quantities of L-carnitine and Acetyl-L-carnitine (both of which play a key role in sperm metabolism). Find out and learn more about Proxeed Plus on the brand's Youtube channel. Proxeed Plus is a patented prenatal male fertility supplement product specifically designed for sperm health. Here's where you can buy Proxeed. I remember the days of trying to conceive. It was always a struggle on my part (not spouses) I had Endometriosis and struggled getting pregnant. I know this too can be a difficulty for men. I have read your conception-pregnancy observations. My cousin has some problem and i am going to tell him.